It’s Follow-Up Friday: More UK Puzzles edition! And today, I’m returning to the subject of big international puzzle events! A few weeks ago, the UK Puzzle Association hosted the 2016 UK Sudoku Championship. And this weekend, they’ve got another major puzzle event in store for puzzlers worldwide: The 2016 UK Puzzle Championship! The event spans June 24 through June 27, and chairman Alan O’Donnell of the UK Puzzle Association sent out the Instruction Booklet for this year’s event a few days ago, continuing a string of major puzzle events in Europe and across the world. Although the UK Puzzle Championship is only open to competitors from the UK — with the top two earning a place on the UK team for the 2016 World Puzzle Championship — international players are welcome to test their puzzly mettle as guest solvers. But even if most PuzzleNationers aren’t eligible to compete, you can still enjoy the challenge of some topnotch puzzles. Let’s take a look at some of the diabolical puzzles they’ve cooked up for this year’s event! This Banknotes puzzle sets the tone for much of the Instruction Booklet to come, offering a number-placement puzzle with clues outside the grid. 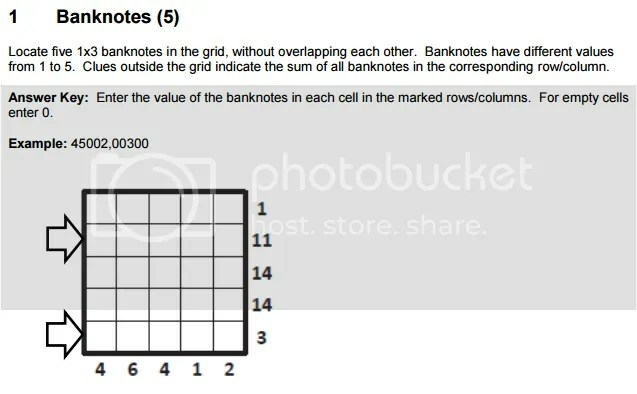 In this case, you have different valued 3×1 “banknotes” to place in the grid, and their total values add up to the numbers outside a given row or column. So this is a bit like the game Battleship, except with different valued ships instead of different sized ones. Here we have a more traditional Fill-In puzzle, but with an nontraditional grid shape. This one is all about efficient word placement. 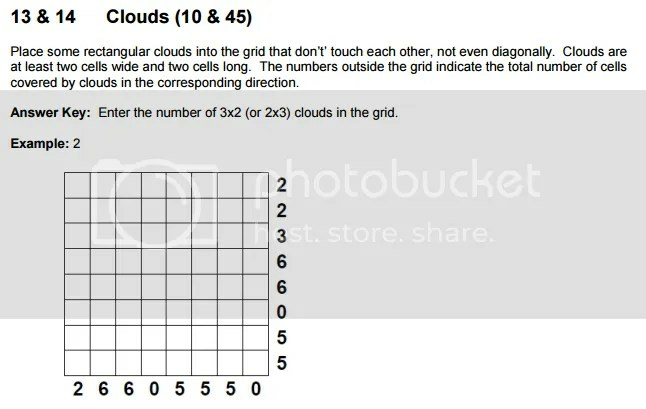 Instead of placing words into this grid, the Cloud puzzle asks you to fill in which squares are covered by “clouds,” based on the total number of cloud-covered cells given on the outside of the grid. This is essentially a small Logic Art puzzle. 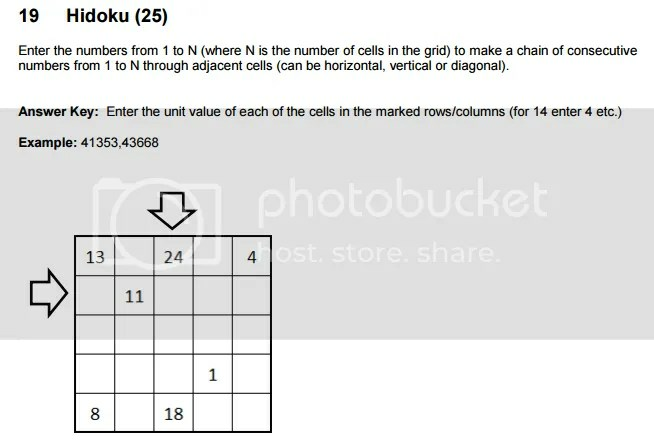 This Hidoku turns the usual Sudoku-solving on its ear by requiring you to place the numbers 1 through 25 into the following grid so that they form an unbroken chain. Consecutive numbers must touch, either horizontally, vertically, or diagonally. For fans of Penny Dell Puzzles, this is like Sudoku and Word Maze had a diabolical little baby. Hashi is an intriguing deduction puzzle that follows the same cluing mentality as Blackout! or Minesweeper. 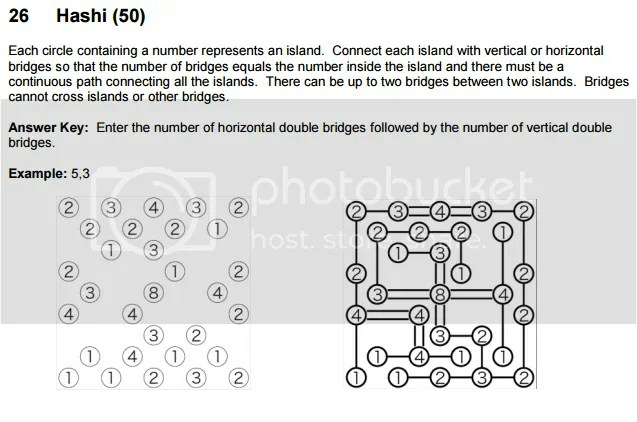 Each circle contains a number indicating how many “bridges” connect that “island” to the other islands either vertical or horizontal to that island. You’re essentially building your own Word Trails puzzle with Hashi, except you’re using numbers instead of the letters in a famous saying. This is probably my favorite of the puzzles I’ve encountered in this Instruction Booklet, and I’m definitely looking forward to solving it this weekend. These puzzles are just a sampling of the numerous puzzles you’ll tackle if you accept the UK Puzzle Championship challenge. Not only are Kakuro and Sum-Doku (or Killer Sudoku) included, but also other twists on classic solving styles like Fill-Ins, Deduction puzzles, and Logic Problems. You can check out the full Instruction Booklet here, and remember, you’ll have two and a half hours to solve as many of the 29 puzzles in the packet as possible, so good luck on June 24! For more than a century now, crosswords have been the premier pencil-and-paper (or pen-and-paper, if you’re confident) puzzle, but a close second would have to be Sudoku, which has exploded in popularity over the last decade or so. The simple concept behind Sudoku — a 9×9 grid arranged so that the numbers 1 through 9 only appear once in each row, column, and 3×3 square — is easily modified for any difficulty level, from beginners to topnotch solvers. The classic form of Sudoku, originally known as Number Place or To the Nines, is instantly recognizable. But virtually any set of nine different symbols, characters, numbers, or letters can be used as clues for a Sudoku-style solve. That gives us variations like Picture Sudoku or Color Sudoku, where the same deduction is involved, but the solution is a bit more vibrant. 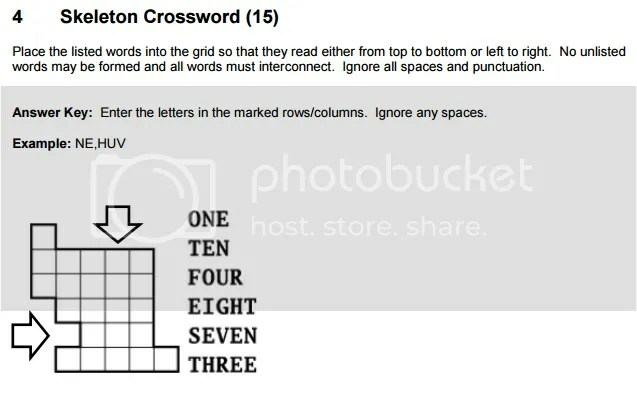 Word Sudoku follows the same concept, replacing the numbers 1 through 9 with letters, allowing for the added bonus of a 9-letter word reading out along one of the rows. I’ve seen Word Sudoku variations in all sorts of languages, which is neat, because you can still solve the puzzle even if you don’t know the language; you’re simply choosing different symbols. Using letters instead of numbers often factors into larger Sudoku puzzles. While Penny/Dell’s Mega Sudoku is a 16×16 grid using the numbers 1 through 16, other large-scale Sudoku puzzles use letters instead of numbers above 10, while others go so far as to remove the numbers altogether, giving you the option of puzzles that span nearly the entire alphabet! And since we’re already discussing bigger Sudoku puzzles, it’s worth mentioning smaller Sudoku puzzles. Often called Mini-Sudoku or Sub-Doku, these puzzles start at 4×4 grids (using only the numbers 1 through 4) and increase in size all the way up to the standard 9×9 grid. Those are just the puzzles that use standard Sudoku rules. There are numerous types of Sudoku that add new rules or curious wrinkles to the standard solve. Perhaps the most famous variant is known as Extreme Sudoku, Diagonal Sudoku, or X-Sudoku, and there’s one crucial difference: the numbers 1 through 9 also appear only once along each diagonal. This additional rule helps with solving, but Extreme Sudoku puzzles often have fewer set numbers in order to keep the difficulty level interesting. Another popular variation is known as Jigsaw Sudoku or Geometric Sudoku. These puzzles abandon the standard 3×3 boxes, instead using various Tetris-like shapes within the 9×9 grid. Each of these pieces contains each number 1 through 9, and the standard rule of no repeats within a row or a column remains. These puzzles can either have random shapes or shapes with the same diagonal symmetry that rules both crossword grids and the placement of set numbers in classic Sudoku grids. Some variations involve more deduction as well, like Neighbor Order Sudoku or Greater Than Sudoku. These puzzles feature small arrows that indicate whether the number in a given square is larger or smaller than its neighbor. That’s just the start of math-based Sudoku variants that exist. Sum-Doku or Killer Sudoku uses the standard one-per-row, column, and 3×3 box Sudoku rule, but also adds numerous smaller Tetris shapes and boxes, each with a total. The numbers within that smaller box add up to that total. Another popular variant involves overlapping Sudoku grids. You could have two 9×9 grids that share one 3×3 box, or two 9×9 grids sharing four 3×3 boxes, or you could have more grids overlapping in all sorts of ways. The best known overlapping Sudoku puzzle is probably Samurai Sudoku, which features five 9×9 grids, one at the center and one at each corner, so the 4 corner 3×3 boxes of the center grid link the puzzle together. Not only is it a Samurai Sudoku with diagonal symmetry for all the set numbers, but each of the four corner grids operates under a different set of variant rules. The upper left grid uses Extreme Sudoku (or Diagonal Sudoku) rules, the upper right grid is an asymmetric Jigsaw Sudoku (or Geometric Sudoku), the lower left grid has shaded the location of every even-numbered number to aid your solving, and the bottom right has two shaded ribbons weaving throughout the grid, each of which also includes each number from 1 through 9 once. As you might expect, there are plenty of variations of Samurai Sudoku. My personal favorite is known as Shogun Sudoku; it’s two linked Samurai Sudoku grids — meaning there are ELEVEN linked 9×9 grids — and there are even larger variations out there for the solver who simply can’t get enough of overlapping Sudoku puzzles. Our friends at Penny/Dell Puzzles have several titles that offer a variety of different Sudoku puzzles. The four grids above all appear in various issues of Will Shortz’s WordPlay, all courtesy of Sudoku constructor Thomas Snyder. You should also check out the Sudoku Spectacular title (featured in our Holiday Puzzly Gift Guide!) as well as their upcoming Will Shortz’s Sudoku title. I would also be remiss if I didn’t mention the mathier cousins of Sudoku. Kakuro, also known as Cross Sums, follows the same no-repeats rule of classic Sudoku, but the grids are much closer to Crosswords. The numbers along the top and left-side are the total for each row or column, and they are the primary clues for solving the puzzle. Kakuro rarely features set numbers the way Sudoku does, instead opting for a single filled-in row or column to get the solver started. KenKen takes the addition from Sum-Doku and adds subtraction, multiplication, and division to the mix. Each box has a number and a mathematical symbol. The number is the total, and the symbol is how the missing numbers interact to reach that total. For instance, in the upper right corner of the grid, there’s 24X. That means the two missing numbers from that box, when multiplied, equal 24. And since this is a 6×6 grid, following the same one-per-row and column rules of Sudoku, you know that 4 and 6 are the missing numbers in that box, but you don’t necessarily know where to place them yet. When it comes to Sudoku, the variations on shapes and layouts are seemingly endless. I’ve seen diamonds and snowflakes, cubes and five-pointed stars, in all sorts of sizes. You can get Samurai Sudoku with 6×6 grids, Jigsaw Sudoku in miniature, and Word Sudoku with Egyptian hieroglyphics. While researching this post, I encountered this marvelous Sudoku variant, which the constructor calls Star Sudoku. The numbers 1 through 9 appear once in each triangle, and there are no repeats along any row or slanted column. This puzzle is not only clever, it’s flat-out neat. So, fellow puzzlers, what’s your favorite variation of Sudoku? Or do you prefer to stick with the classic version? Let me know! I’d love to hear from you!